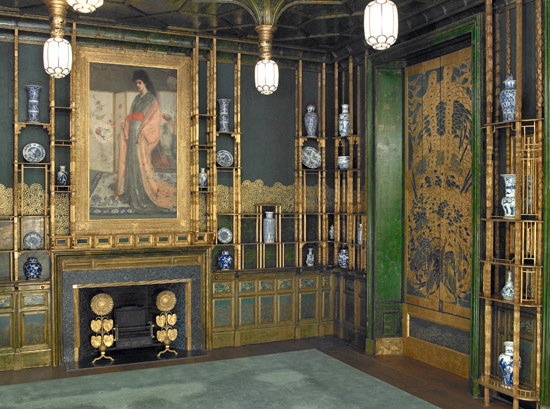 Before the Peacock Room became a work of art by Whistler, it was the dining room in the London home of Frederick Leyland, a shipping magnate from Liverpool. A wealthy self-made man and an "aristocrat of taste," Leyland collected Chinese porcelain as well as Old Masters and Pre-Raphaelite painting. 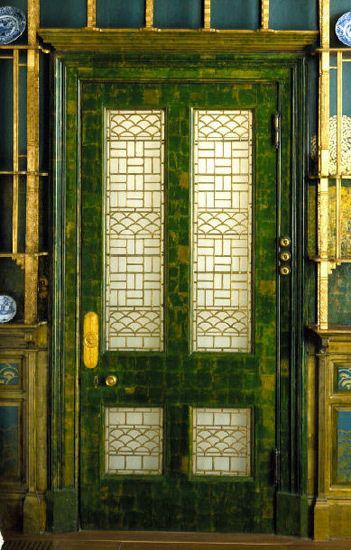 He leased a grand house at 49 Prince's Gate in the fashionable neighborhood of Kensington in the mid-1870s, and he envisioned his new home as a palace of art that embodied his refined aesthetic sensibilities. Southeast corner of the Peacock Room in April 1876. Rendering by Peter Nelsen. Leyland hired the gifted architect Thomas Jeckyll to redesign the dining room in his new home. 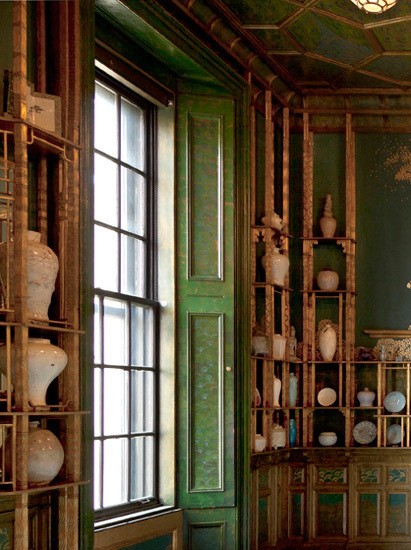 Jeckyll incorporated gilded antique leather wall hangings and latticework shelving to showcase Leland's prized collection of Chinese blue-and-white porcelain. 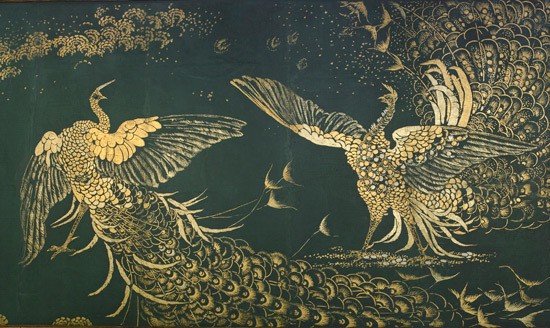 Jeckyll and Leyland conceived of the room as a sort of neo-rococo exercise in chinoiserie. The long windows on the east side overlooked a private park, and the décor was meant to evoke a European notion of a Chinese garden pavilion. "Ginger jar" with cover. Qing dynasty, mid 17th-early 18th century. Porcelain with cobalt pigment under clear glaze. 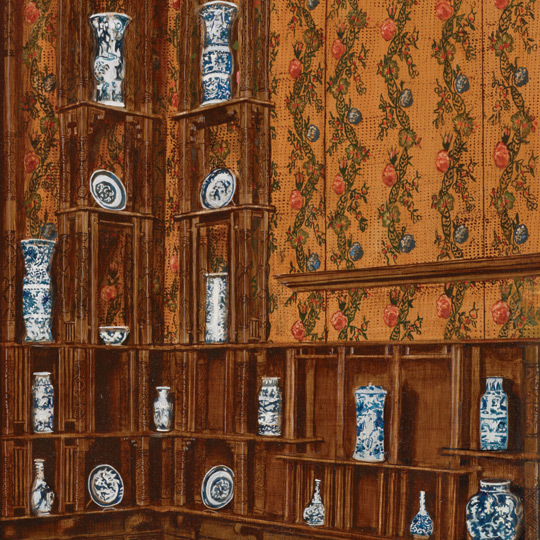 In Jeckyll's architectural scheme, each shelf was designed to hold a Chinese porcelain of standard shape and size: vertical niches along the top were for tall slender vases; square niches between the doors would hold large dishes; and eye-level shelves throughout the room would display brush pots, censers, and so-called hawthorn jars, much like the one shown here. Leyland's collection was dispersed at auction after his death in 1892. Peacock Room in October 1876. Rendering by Peter Nelsen. Inspired by the delicate patterns and vivid colors of the Chinese porcelains and the blue and gold motif of a peacock feather, Whistler commenced what became an extreme makeover of the room. He added a wave pattern on the cornice and woodwork, and he painted over the red flowers on the leather wall hangings. He felt they clashed with the delicate tonalities of his painting, La Princesse du pays de la porcelaine, which was hanging over the mantel. Leyland approved these changes and then left town on extended business. View of the south east corner of the Peacock Room. Alone and unsupervised, Whistler let his imagination take flight. 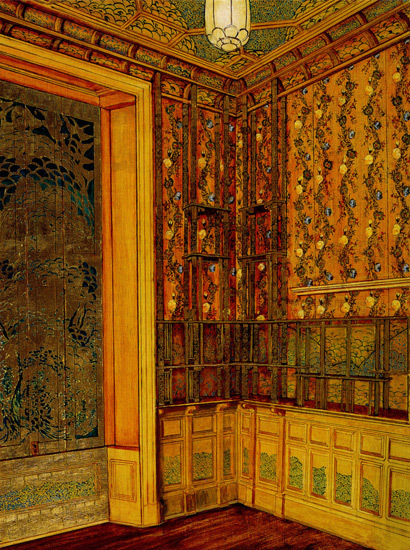 He covered the room, from the ceiling to the walls, with peacock patterns, and he painted monumental blue and gold peacocks on the shutters. Eventually Jeckyll's version of the room was transformed from a porcelain cabinet into a complete work of art. 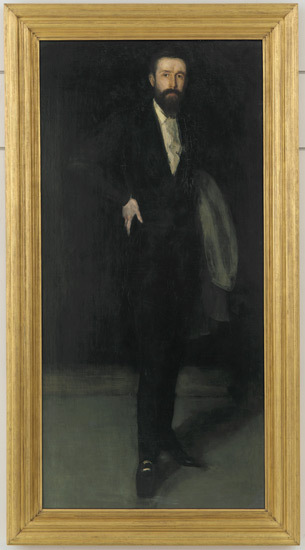 In his letters to Leyland, Whistler hinted about the "gorgeous surprise" awaiting his patron, but when Leyland returned to London, the change to his dining room was more than he had anticipated. The two men quarreled over the extent of Whistler's redecorations - and to Leyland's mind, the exorbitant fee attached to them. 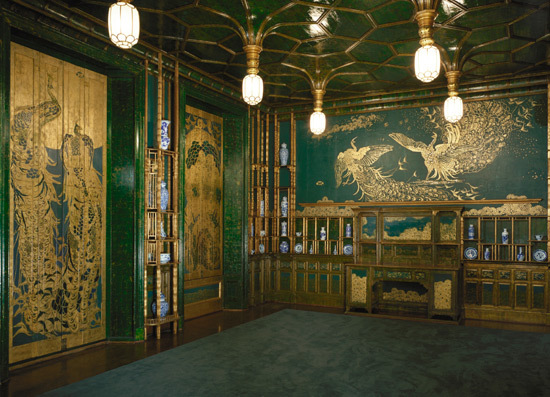 South wall mural of Harmony in Blue and Gold: The Peacock Room, James McNeill Whistler, 1876-77. Hurt and angry, Whistler concluded his work with a vindictive allegorical mural of two battling peacocks pointedly titled "Art and Money: or, the Story of the Room." The artist is the poor peacock on the left. Its silver crest feather refers to Whistler's distinctive white forelock. Leyland, the rich but stingy patron, is the peacock on the right, glittering with coins. The World only knows you as the possessor of that work they have all admired and whose price you refused to pay… From a business point of view, money is all important. But for the artist, the work alone remains the fact. That it happened in the house of this one or that one is merely the anecdote — so that in some future dull Vasari — you will go down to posterity, like the man who paid Correggio in pennies! View of the north east corner of the Peacock Room. Leyland ordered Whistler from his house, and the artist never saw the Peacock Room again. Despite his rage, Leyland clearly recognized something of value in Whistler's work, and he never changed a thing in the room. 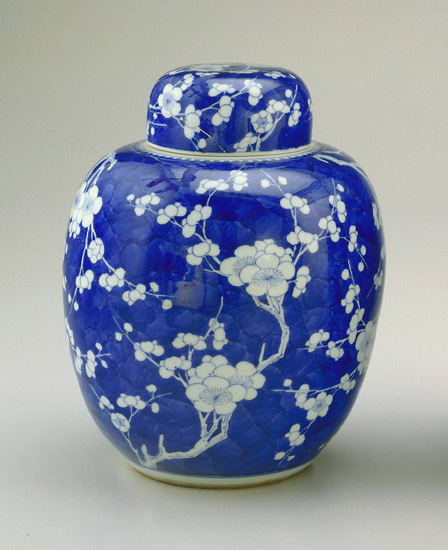 Until his death in 1892, Leyland continued to use the dining room and to display the collection of Kangxi blue-and-white porcelain on its shelves. He even allowed visitors to tour the notorious room. Critics occasionally wrote about it, thus keeping the "story of the room" alive into the next generation.